The mission of the Albrecht-Kemper Museum of Art is to foster the appreciation of American culture and the visual arts through education, the nurturing of regional artist, and the display of the permanent collection as well as temporary exhibitions. What better way to nurture young local talent than through exposure in a museum-sponsored juried art competition? 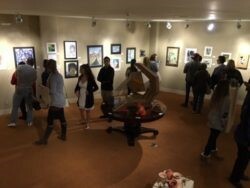 The Regional High School Art Exhibition is an invitational exhibition, with over 75 schools from Northwest Missouri and Northeast Kansas asked to participate. Artworks are divided into nine categories based on media and/or technique. After a panel jury selection, First, Second, and Third Place, plus Honorable Mentions, are awarded in each category. CONGRATULATIONS TO ALL OF OUR PARTICIPANTS…THE SHOW IS OUTSTANDING!